Two decades after Jeffrey P. Bezos started Amazon in his Bellevue, Wash., garage, his e-commerce juggernaut could be forgiven for letting up on its rapid growth. Not Amazon, though, which steamrolled through 2015, capturing an ever-growing share of United States retail sales. Of every additional $1 Americans spent for items online this year, Amazon captured 51 cents, according to a recent estimate by analysts at Macquarie Research. And of the expected $94 billion growth in all retail sales this year — both in stores and online — Amazon took a staggering $22 billion, or almost a quarter, Ben Schachter, a retail analyst at Macquarie, calculated. And this year’s holiday shopping season served to solidify the notion that the Internet is increasingly Jeff Bezos’s world and the rest of us are just shopping in it. Amazon capped its blockbuster year by reporting what it said was a record-breaking holiday season, shipping 200 million items through its Prime subscription service, which offers free shipping and a host of other benefits. “They were just trying to sell more by underpricing everybody,” said Craig Johnson, president of Customer Growth Partners, a retail consulting firm. For one, this year’s surge has made investors increasingly confident that Amazon’s retail business is maturing, following years of heavy investment in infrastructure and logistics. Amazon has blanketed the country with more than 100 warehouses, and is building more, speeding up shipping times. That investment is now paying off in the steady growth in users of its Prime fast-shipping membership program, which now covers an estimated 25 percent of all American households. Amazon picked up three million new Prime members during the third week of December alone, the retailer said this week. Some analysts estimate that half of all American households will be Prime members by 2020. There may have been five “droppers” – a theatrical term for fainting audience members – overcome by the fake bloodshed at Titus Andronicus at The Globe last year, but one new play is promising considerably more than the nine brutal on-stage deaths in Shakespeare’s first tragedy. 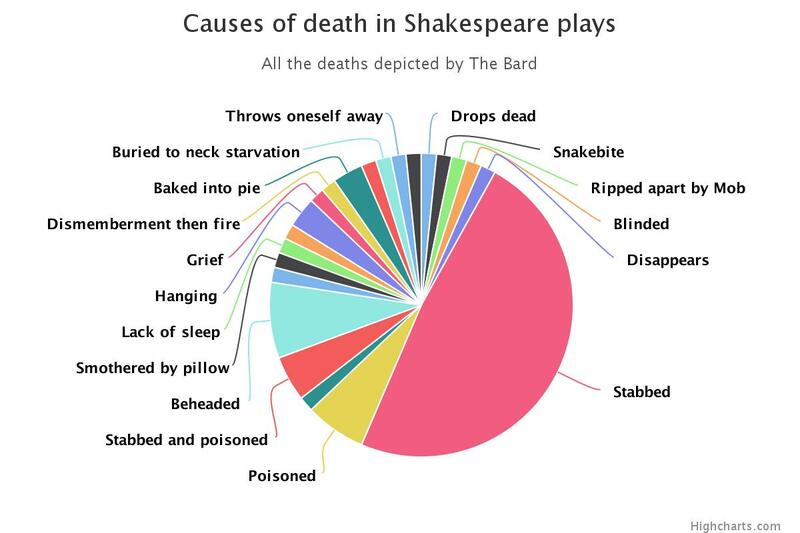 The Complete Deaths will detail all of the Bard’s 74 scripted deaths in one play, from early rapier thrusts to the more elaborate viper-breast-application adopted by Cleopatra. The total makes Shakespeare’s complete works more gory than notorious HBO TV show Game of Thrones, which has scripted 61 deaths in 50 episodes, including the controversial burning of a child at the stake. On 24 December 1977 in Créances, France, Maxime Masseron, 80, and his wife sat down for their Christmas Eve meal. They had decided to open a bottle of Côtes du Rhône given to them by their nephew, Roland Roussel, in the summer. The elderly couple were normally abstemious and they had saved the bottle for a special occasion. Perhaps they toasted their nephew before they took a drink. A few minutes later Maxime was dead and his wife was unconscious. Fortunately a neighbour found the couple and Mrs Masseron was rushed to hospital but was still in a coma 11 days later. Doctors thought it was a case of food poisoning; the couple had made a mistake in the preparation of their festive food, a tragic accident. However, the diagnosis came into question a few days later when the couple’s son-in-law, Paul Isabert, and the local carpenter, Roger Regnault, called at the Masseron’s home. The bottle of wine was still on the table. Perhaps the pair drank to the memory of Maxime or to the speedy recovery of his wife. Maybe they just didn’t want to waste the wine. Whatever the reason, they both collapsed on the floor unconscious. Thankfully, Isabert and Regnault both recovered but it was now clear that it wasn’t food poisoning that had affected the Masserons and the police got involved. Analysis of the remaining wine revealed it wasn’t just Côtes du Rhône in the bottle, there was also a lethal poison, atropine. Roussel, who had presented the wine to the Masserons, immediately fell under suspicion and a police search of his apartment yielded some damning evidence. There were bottles of medicine and poisons; magazine and newspaper articles on poisons and, most suspiciously, several Agatha Christie novels. Christie is renowned for her use of poison in her crime novels and her collected works are a rich source of information and inspiration for the potential murderer. Christie is absolutely right that atropine can be obtained from eye drops. In the appropriate dose, applied directly to the eye, atropine dilates the pupil by paralysing the muscles that normally cause it to contract. The other symptoms described by Christie are exactly what you would expect for atropine poisoning. As Roussel found out, Christie is not an infallible guide to committing the perfect crime. The science in Christie’s crime stories is usually of a very high standard but a lot has changed since the time she was writing. Today sophisticated analytical techniques mean a broad range of poisons can be tested simultaneously and atropine could be identified with a very high degree of accuracy even if it wasn’t initially suspected. I don’t think Christie can be blamed for inspiring Roussel – he had certainly done a lot of additional research into poisons – but unfortunately for him, not enough to get away with it. Link to the rest at The Guardian and thanks to Sean for the tip. Not working out for me. So why not leave 2015 with a bang? Haters gonna hate. To quote the great Tywin Lannister, Lions do not concern themselves with the opinions of sheep. Today I’m going to say something that could quite possibly be grossly unpopular, but whatever. It’s for your own good. I’m feeding y’all broccoli to offset all that fudge and alcohol you’ve consumed during the holidays. There’s a trend that just makes me see red and I’m calling it out today because if we do not address this 500 pound used paper elephant in the room, then it’s going to be really, really hard for you guys to reach your dreams, which I assume is to work as a full-time PAID writer. For those of you who do NOT want to be PAID to write? The following does not apply. If you are content to work a full-time regular job AND slave over a manuscript as a second job and your ONLY reward is simply nice reviews, compliments, hugs, cuddles, and the joy your stories might create in the hearts of others? Yesterday, I was on Facebook and it would have been one thing to see one writer post this link. But I saw like TEN writers post this link and they were excited…as if this Washington Post article were announcing a GOOD thing for our profession. In an Age of Amazon, Used Bookstores Making an Unlikely Comeback. Here’s the deal. I don’t care about bookstores. I care about writers. In fact, readers should care about writers more than bookstores because no writers? Well no real point in bookstores now is there? Want to support the arts? Pay artists. Want to support books? Pay writers. It is simple. Often, we blog for free (though if you do it the way I teach you actually DO get a return on that investment). Once we are published? We do interviews and guest posts for…FREE. So please. Do not expect to ALSO get our books for free. We are frankly DONE with free. How can a writer get PAID? Digital pays writers the best. Then print copies. NEW ones. Buy on-line or in a bookstore or at an event in person. We writers get a royalty. Depending on the contract, writers can even get paid if a book is checked out of a library. That library PAID for the book and the writer was then, in turn, paid a royalty. Upon so many times checked out? The writer is then PAID again for a new “copy” of the book. Want to support a writer in the new year? BUY BOOKS. Writers are NOT PAID for the purchase of used copies. So while I LOVE used bookstores I want to make a point here. Writers MAKE NO MONEY. To be clear, I do not mind used bookstores. What I mind is the attitude that somehow digital is bad and Amazon is bad whereas “paper” and used bookstores are “cultural” and therefore GOOD and preferable for writers. Want to support civilization? Buy old books. Want to support a writer and his/her family and career? Buy new ones or e-books. Encourage and educate readers to do the same. Because here is the deal. If we writers go around cheering how AWESOME used bookstores are? How the heck are readers going to know they are benevolently gutting our careers? They (readers) see us posting the links. They ASSUME we are benefitting. They have no idea how we get paid. Why not direct them to places where we might make money? Link to the rest at Kristen Lamb’s Blog and thanks to Scath for the tip. Here’s a link to Kristen Lamb’s books. If you like an author’s post, you can show your appreciation by checking out their books. When you go to the library for a book to read, I’ll bet the notion that it might carry germs never even crosses your mind. But the truth is, any object that people touch picks up germs—especially objects that lots of people touch. That’s why supermarkets these days have sanitary wipe dispensers with the shopping carts. And the thing about library books—especially popular library books—is that they end up getting touched by lots of people. That’s what a post on Mental Floss points out, looking at the history of research into “library book grossness.” It includes mention of experiments in which guinea pigs were injected with a solution extracted from the pages of dirty library books, and promptly ended up dying of tuberculosis, strep infections, and other nasty diseases. A girl about 5 years old sits on the floor with Dr. Seuss. A teenage boy in a hoodie checks out the young-adult fiction. A white-haired man flips through a military history. They’re all visiting the Barnes & Noble on Austin Street in Forest Hills, Queens, on a recent Saturday afternoon. And right now the joint is jumping. Eleven customers stand on line, three cashiers at the ready. But seeing is deceiving, as James Joyce wrote. For soon this bookstore, at this location since 1995 and all of three blocks from where I live, will close shop. The rent is going to triple, and Target will move in. A petition to save the store, signed by 5,700 local residents, went for naught. Last year, Barnes & Noble closed its branch in Fresh Meadows, and it will do the same with its Bayside store this year. That will leave the chain unrepresented in Queens, home to 2.3 million people and the most ethnically diverse place on the planet. Yes, this city has a great library system, granting New York natives and immigrants alike easy access to literally tons of literature, not to mention a vast inventory of music and other culture, all for free. But sometimes you want to own a book, to claim it as yours alone rather than share it, to take it home and put it on your night table and keep it for as long as you wish. [B]ooks are supposed to be different from toaster ovens. Books are meant to be cradled in your hand. To have pages you can turn with your fingertips. To have words printed in ink. We often visit bookstores in a quest for stories, insights, the truth. Which is why, in France, lawmakers have barred discount-crazy online retailers from killing brick-and-mortar competitors. You can say that law is anti-Amazon — but really it’s pro-bookstore. Link to the rest at The New York Daily News and thanks to Nate for the tip.